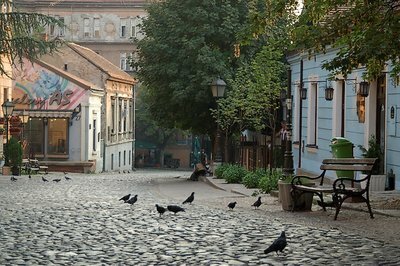 Lively, mysterious and affordable and with a fascinating history forged through the war and woe of Balkan geopolitics, the Serbian capital can feel worlds away. This city of two million blossoms in spring, when evenings bring entire families out into the Mediterranean sun at the many terrace cafe's, while the fast-paced nightlife spreads outdoors as well, to boats moored on the river. Given all of this, it is hard to believe that Belgrade was a NATO bombing target as recently as 1999. Before Yugoslavia's meltdown in the 1990s, Belgrade was the capital of the most advanced country in the old East Bloc. That is why, compared to other Eastern European countries, more Serbs speak English, the importance of good service is widely appreciated and a positive can-do attitude generally pervades. With a thriving cafe and restaurant culture, famous nightlife and a passion for arts and literature, the Serbian capital city of Belgrade offers affordable metropolitan living at the crossroads of Central and Eastern Europe. 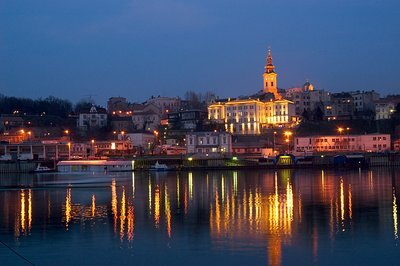 Check our Belgrade Sightseeing Tours section to find different interesting ways for exploring Belgrade. The Belgrade Maps site contains good maps of public transportation. You can catch a taxi in the streets at any time anywhere in the city. For an overview of the city, check our map of Belgrade. If you need to locate an address or an object on a map, the best online service to do so is PlanPlus. Under the "More Options" menu you can chose "Places of Interest" which will give you an option to display specific places of interest such as restaurants, caffes, museums, monuments, etc. Kalemegdan: The Kalemegdan fortress has a very long history, going back at least to the castrum of Roman times; destroyed several times by successive waves of invaders, was rebuilt as a castle by the Byzantines in the 12th century. Under the Serb Despot Stefan Lazarevic, son of the king Lazar, Belgrade became the capital of the Serbian kingdom; the fortress was strengthened, and the Despot's palace was built within the old castle. A medieval town grew up within the walls of the lower fort (a model is on display on one of the upper terraces). Rather than looking for specific places and monuments, it is more rewarding just to stroll in the parks and along the walls of the Kalemegdan, watching the panorama from the terraces looking toward the rivers Sava and Danav . However, you can see not very well preserved Roman ruins and a Roman well (reconstructed 1731), the tomb of a Pasha, the most ancient gates of the fortress such as the one of the Despot (15th century), the clock tower, the People's Observatory (amateur astronomical observatory), the monument � la France (out of gratitude for the help of the French troops in the 1915-1918 war), the statue of the Winner by Mestrovic. Knez Mihajlova: pedestrian zone and shopping centre - protected by law as one of the oldest and most valuable monumental complexes of the city, with a large number of representative buildings and urban houses built at the end of 1870s. The streets is also packed with world chain fashion shops. National Museum of Serbia: Founded in 1844, located at the Republic Square. Since it was founded, its collections have grown drastically. Today, the museum has a collection of over 400,000 objects including many foreign masterpieces. Sveti Sava Church: This is the largest Orthodox Church in the world located only minutes from the city center. It has been under construction for over 50 years but received a nearly completed look since last year. Though the outside appears nearly complete, the inside is still under construction. Despite this, visitors are welcome to look around inside and people come to light candles and pray. A small kiosk inside sells icons. If you approach the church and the doors are closed, try walking around to the side or back to find an open door. A beautiful park always full of people surrounds it. It is a breathtaking site that includes the statue to Karadorde (Black George) and the statue to St. Sava. Next to the St. Sava church there is also a much smaller orthodox church and the National Library. You are expected to see people walking along the park in front of the church at all times as it is popular with youth and seniors. Skadarlija: (Skadarska street) In the eastern part of the old city, which used to be a hedonist quarter, there are several streets with interesting shops and well preserved buildings. In particular you should visit Skadarlija , which is the popular name of the street, whose actual name is Skadarska, and which is immediately east of Republic Square. This pedestrian only street has an appearance as it did in the 19th and early 20th century. Restaurants and pubs fill most of it with their open air tables, there are art galleries and bakeries open all night, folk groups singing either gypsy music of traditional city music, people dressed in traditional Serb costumes (presumably supported by the local touristic organizations). Republic square (the main city square): The present square was formed after the demolition of the Stambol Gate in 1866 and the construction of the National Theatre in 1869. The Gate had been built by the Austrians at the beginning of the XVIII century, and stood in the area between the present monument to Prince Mihailo and the National Theatre building. It was the largest and most beautiful town gate at the time when Belgrade was encircled by the moat. It was named after the road, which led through it - to Constantinople (Istanbul). The people remembered the Stambol Gate as the place in front of which the Turks executed the "raya", their non-Muslim subjects, by impaling them on stakes. Old Palace: The Royal Palace of the Obrenovic dynasty of Serbia, presently housing the City Assembly of Belgrade, is situated at the corner of Kralja Milana and Dragoslava Jovanovica streets. It was built between 1882 and 1884, according to the design of Aleksandar Bugarski, in the style of academism of the XIX century, with intention to surpass all existing residences of the Serbian rulers. Tours within the palace are available to visitors. The Tito mausoleum: You will not find it in any travel book that was issued in Serbia, nor will the tourist information inform you about that museum. However, it works! Take the bus Nr 40/41 from Studentski Trg or from Kneza Milosa street in the direction Dedinje and ask for "Kuca cveca" (House of the flowers). Entry is free of charge, but the museum closes in the afternoon. It is the grave of communist leader of Yugoslavia, Josip Broz Tito. Ada ciganlija: A river island on Sava river with artifical lake in the centre of the city.Huge lake has 8 km long beach, where is usually about 300000 bathers during summer. Great for sports and picnics. In summer it is swamped with people wanting to cool down in the water.